Valet service offered in-front of the restaurant. We are located in The Woodlands Mall parking lot. There is parking directly infront or to the right of us. Your Woodlands Fleming’s is located just off of I-45 in the South side of the Woodlands Mall on the Waterway. Whether you’re celebrating, dining with business clients or want to Sunday brunch with friends, we have created the perfect ambiance with a menu filled with your favorites and a local chef’s table that changes with the season, or whenever we feel inspired by our ingredients. Our bar is always open and our wine manager has curated a wide selection of locally selected wines, hand-crafted cocktails and spirits. Need a more private space? Our Private Dining Director is at your service. Welcome to Your Woodlands Fleming’s. Had a wonderful time. Love that the managers introduce themselves to you. Our waitress, Amanda, was excellent. Didn’t over serve but always seemed to be there when we needed something. Great atmosphere, great service and great food. Our server, James, was especially attentive and helpful. Overall great experience. We celebrated our 24th wedding anniversary at Fleming’s. They went out of their way to help us celebrate with a card on the table, two glasses of champagne, their delicious truffles & writing Happy Anniversary in chocolate on our dessert plates. Made the evening extra special. Loved it!!! Way staff was extremely attentive and all of our food was delicious. We were celebrating my 58th birthday and it could not have been any better. 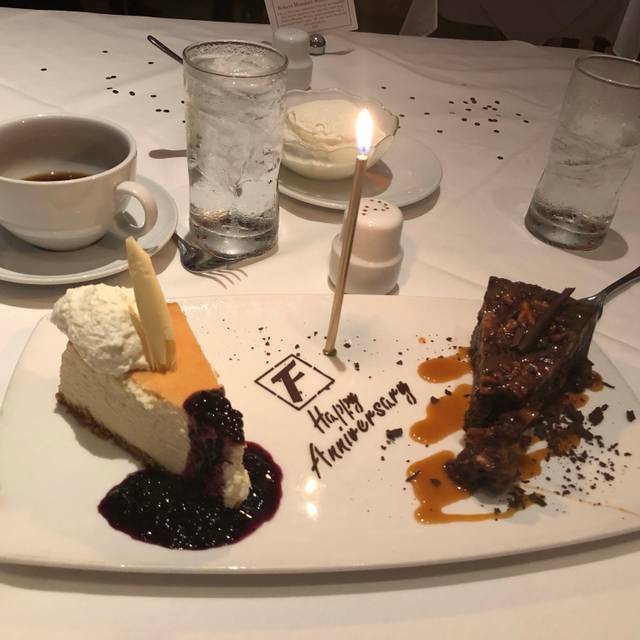 Flemings is pricey but worth it for a special celebration. Always a good experience at Fleming’s. We love this place! Always friendly and our repeat server is so nice and personable with us. We take the kids and they love it as well. They are seasoned restaurant diners and know a good place when they go to one. Team work is in effect when needed here and that is a plus so that service is always on point. One reason we dine out is to be served after working all day and working late, it is nice to have someone take care of you and the value is great, especially if you go when they offer the three course Filet and Lobster menu. We loved our Sunday lunch here! The food and service were both excellent. We love to treat ourselves to Fleming’s. Best dining experience we’ve enjoyed in quite some time! The service and food were both AAA+! 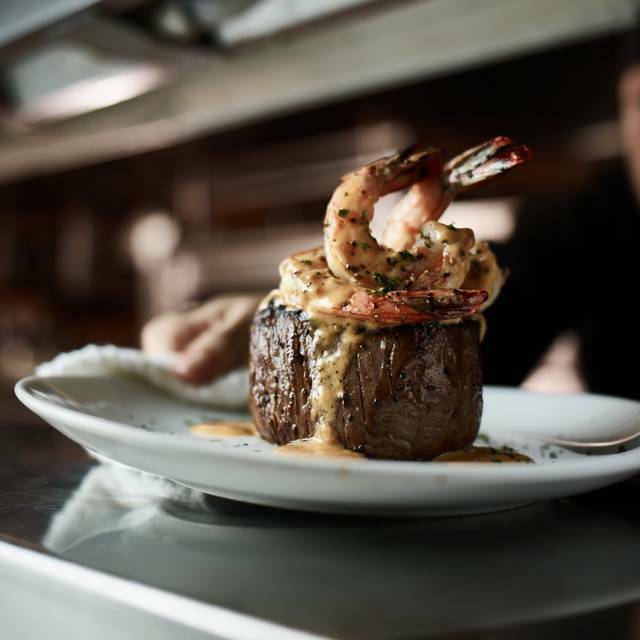 Fleming’s is a quality steakhouse that is consistent in every restaurant we have eaten at. We always order the petite filet and the prime New York with sides of Fleming’s potatoes and grilled asparagus. Order that and wine , you won’t ever be disappointed. We had a phenomenal evening at Fleming's Steakhouse. Our waiter Denzel was equally phenomenal in assuring my wife (who has a multitude of food allergies) had a wonderful experience. The food was exceptional as well. Fleming's definitely bacame an instant favorite for us. Tammy provided GREAT service, and as we celebrated a big 55th birthday, Fleming's and Tammy provided a photo, champagne, desert - and a great setting! Thank you, for making Kevin's birthday all that more special! Our favorite place to eat in The Woodlands. Management is wonderful, always feel welcome. Very consistent in every way. It was our anniversary and they did an amazing job including a visit to our table by Chef Patrick! Good is really good. The steaks are prepared in excellent condition. Highly recommended!!! Our first time to Fleming’s to celebrate the sale of a house. The prices were daunting, but the superior food and service were delightful. I’m glad we went and will return for another celebration in he future. Tammy was our server, and that's who we ask for next next time we go, which will be in early April. She is outstanding !!! James was excellent as our server. Knowledgeable and just right amount of attention. Excellent evening overall. Would have been all 5 star except upcharge to substitute tuna poke was excessive. We enjoyed the most spectacular time on our 13th wedding anniversary. The service was great but the food was exceptional! My wife and I haven't tasted many steaks better than what we enjoyed on that evening. From the complimentary Champagne toast to a personalized birthday card to a framed photo of our table group to a decadent box of handmade truffles, my 70th birthday celebration was a sublime delight. Our food was wonderful, and our service was top-drawer. Fleming’s knows how to make a special occasion MEMORABLE! The biggest disappointment of this date was when my husband ordered a lemonade and his refill glass came with lipstick on the glass. When we pointed it out to our waiter Kevin he simply apologized and that was the end of it. Good customer service when you do something wrong is to take it off your bill offer a free dessert.... something. Then when our meals came out my husband didn’t get everything he ordered; they forgot his baked potato. For us the experience didn’t live up to to hype. If we do try Fleming’s again it won’t be this location. The petite fillet was very good, the sides (mushrooms and Fleming's potatoes) were also very good. Maybe more creativity on the sides would make this one of my go to steak houses. We also liked the wine selection and service. Dinner was amazing! We had one waiter that was great, phenomenal personality, helpful, etc. The other, would take a drink order and it would be 30 minutes before we would see him again, a couple of people in the party ordered drinks, an never received them. Then we asked for the check, after 30 minutes I had to get up and ask what the issue was finally I just said I would handle our “special request” of splitting the bachelors check so he wouldn’t have to cover it. 10 minutes later we finally get them, we all pull out our cards to settle up then it’s 20 more minutes of waiting to get our cards back... Yes an hour to close our tab. Seems a bit too long to wait but when you aren’t being served your drinks it tends to make people on edge. It was a little noisy, food was great. With all of the restaurant choices in The Woodlands my wife and I were very happy we chose Fleming's Steakhouse! Our experiences at other Fleming's helped us make this decision. 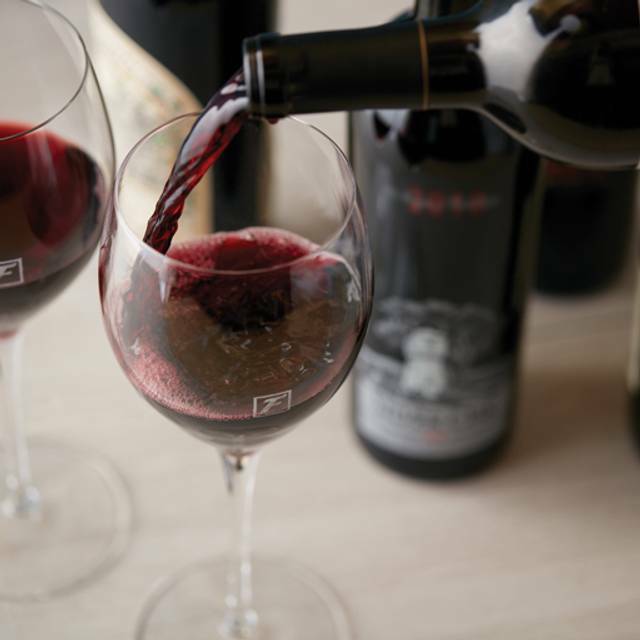 From the valet parking to the excellent wine and food and the great service we were very happy with our experience. Our server Kirsten Campbell was fabulous! She explained the menu, answered our questions and told us about several places we may want to visit while we were in the area. The topper was when she offered me a half glass of wine when she could tell I wasn't sure if I wanted another full glass. That was a first for me and I have eaten at many high end restaurants all over the US. Overall great experience! It was great... as always! 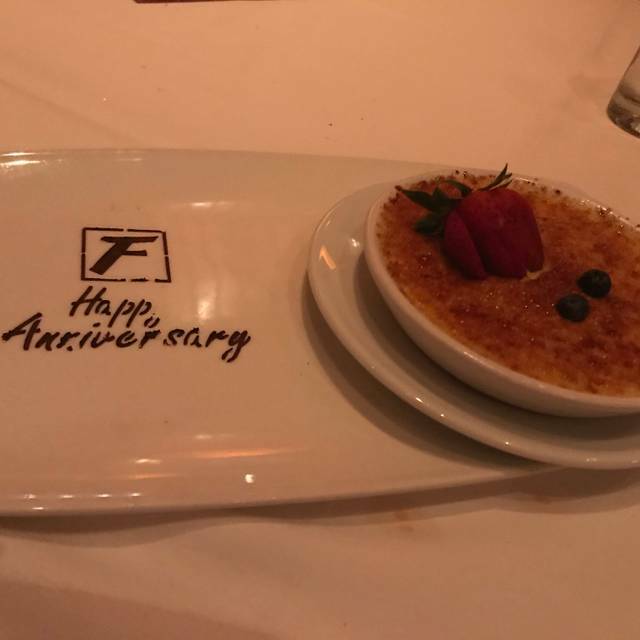 My husband and had been dining together for several years at Flemings. Recently, my husband passed away and the Ms. Allison Gouch and her staffs were wonderful at comforting me. Ms. Allison Gouch sent bouquet of flowers to my home, the dinner I had my husband's son the day after my husband passed away was on the house, and when I went to Flemings on Valentine's Day, a bouqut of yellow Rose's were given to me. I cannot imagine any restaurant treats it customer the way I was treated by everyone at Flemings. I know that it is the company policy and wonderful management make all the compatinate gestures possible. 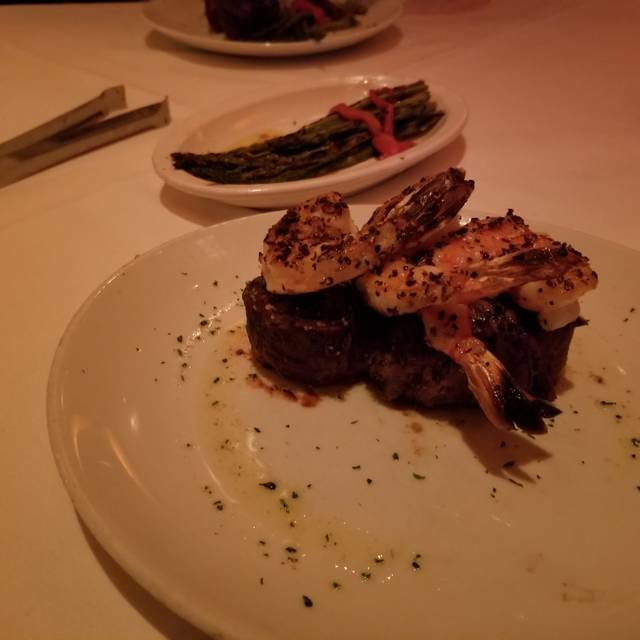 I am very impressed with Ms. Allison and everyone at Flemings in the Woodlands for they have been very compassionate and sweet to me. I thank all of them from the bottom of my heart. 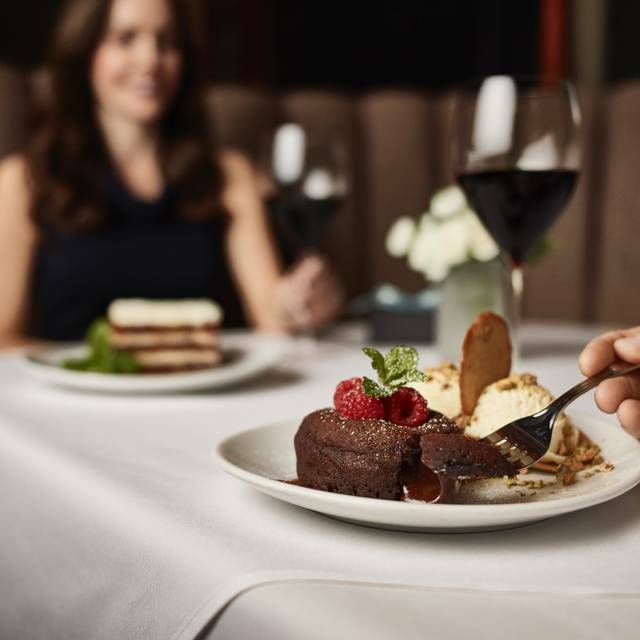 Flemings in the Woodlands is an exceptional place to enjoy good food and the friendship with everyone work there. It is my favorite restaurant in the Woodlands or any where else. Very good food and service. Kevin was a great server. Excellent food and service. Spending a lot on a dinner to be disappointed in any way is a bad feeling, but Flemmings 100% did not disappoint. Highly recommend. Food was not tasty at all but had very great presentation. Lobster tail was disgusting, ribeye steak was very hard. Over all I will not return, food had no flavor. Only good thing were the crab-cakes. Made reservation one month in advance, specifically asking for booth only. Booth was not given. Took 35 minutes to get a glass of wine. 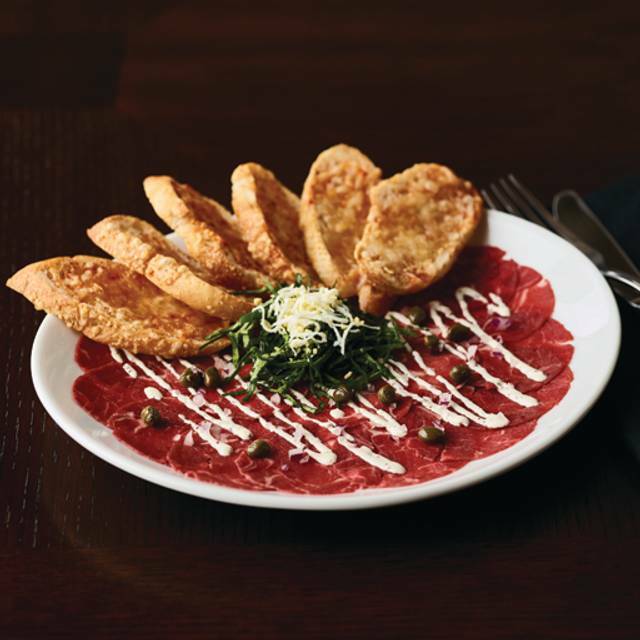 My husband and I dined regularly at Flemings and we said that Flemings was our second kitchen. We celebrated our birthdays, anniversaries, Valentine's Days until my husband passed way. The Manager at Flemings, Ms. Allison Gouch, and all the staffs were very compassionate for my husband's passing. The dinner I had with my husband's son the day after my husband's passing was on the house and I received a bouqut of yellow roses on Valentine's day when I was there with my friends. I have never heard of any restaurant has done such sweet things for their customers. I am so grateful for Ms. Allison Gouch and all staffs love and caring whenever I am at Flemings. Flemings is my favorite restaurant and the best place to have wonderful meals. I thank Ms Allison Gouch and everyone there from the bottom of my heart. 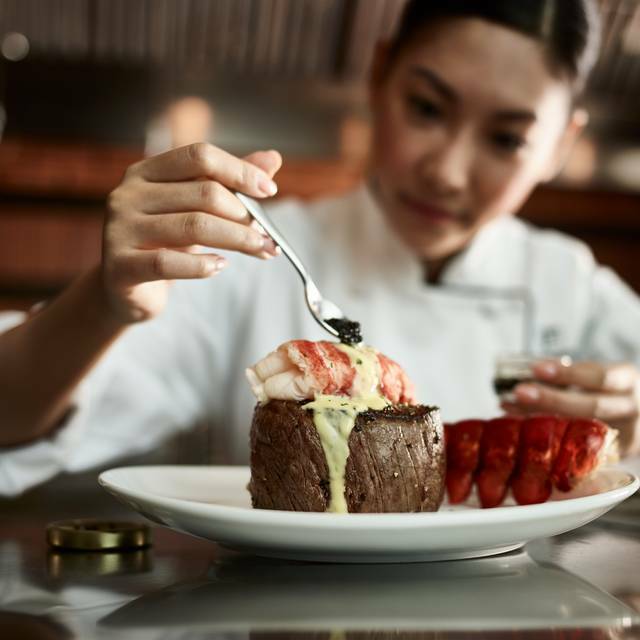 Flemings is a wonderful place to eat because it has a top notch management and staffs who care for their customers. Seated immediately even though the restaurant was very busy. Our waitress, Sammy, did a terrific job. She was attentive and pleasant but didn’t smother us. The food, as always, at Flemings was outstanding. We had there Monday special which was a Caesar salad fillet small lobster tail And dessert for $50 apiece. I went out on Monday instead of fighting the Valentine’s Day crowd and it was very pleasant. Fleming’s has become our “go-to” for special occasions. The food is consistently excellent and we are always treated like special guests and our occasion acknowledged. This last visit, we shared the Tomahawk Steak, on Tomahawk Tuesday. It was charred to perfection and deliciously pink inside. We were even given the choice of their “special” knives by the manager. Each handle made from different materials. We enjoyed 2 salads, 2 sides and 2 of the most fabulous chocolate lava cakes with vanilla ice cream and chantilly cream. I’m not sure what we enjoyed more, the steak or the lava cake. I know this is a chain, but there is not a chain feel to this restaurant. They do a wonderful job with their food and their attention to their guests. Great service! Our waitress' name was Tammy and she was very friendly and knowledgeable. Great good too! 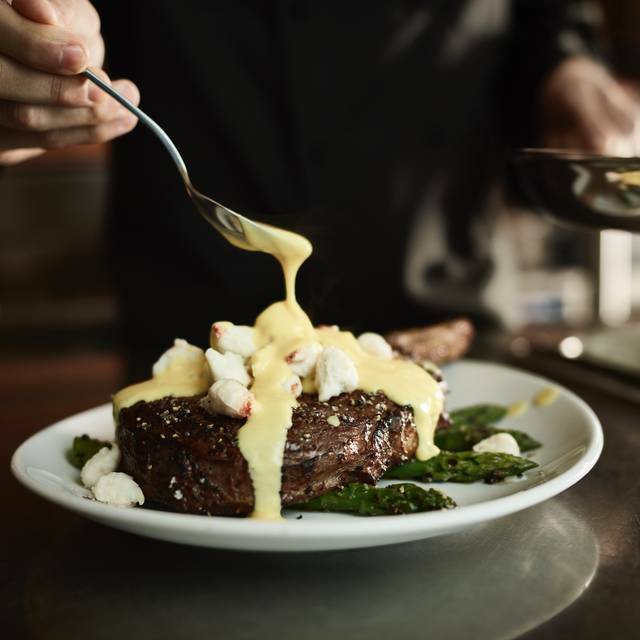 Flemings is consistently good which means we return again and again! The service is excellent as well as the food.